Volleyball and More is your source for volleyball team packages. 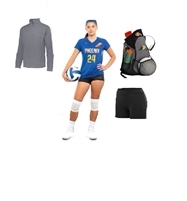 We offer stock and custom volleyball gear team packages to fit your needs. Complete volleyball gear team packages can be customized with your team colors and mascot or logo! Design each custom volleyball uniform with player names, numbers or both. We offer both Mizuno volleyball team packages and Asics volleyball team packages. 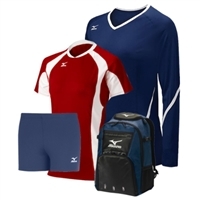 Get matching volleyball accessories with embroidered logos, initials or player numbers. Our embroidered volleyball uniforms or screen printed volleyball team jerseys can be ordered online or by phone. Order your uniform packages here.